The Hyunmoo-2A is a short-range, solid-fueled ballistic missile developed and deployed by South Korea. The Hyunmoo-2A, 2B, and 2C missiles are critical elements in South Korea’s ‘Kill Chain’ (preemptive strike) and ‘Korea Massive Punishment and Retaliation,’ or KMPR, (retaliatory strike) defense strategies. The Hyunmoo-2A has a range of 300 km. 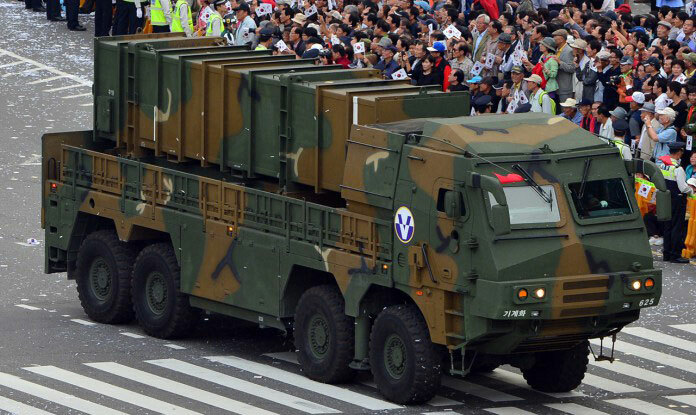 Several reports note that the Hyunmoo-2A and 2B variants appear similar to the Russian 9k720 Iskander-M missile.5 Given that South Korea and Russia have worked together in the past on ROK rocket and missile programs, it is possible that Russia provided some technical support during the Hyunmoo-2A and 2B development process.6 One analyst noted, however, that the Hyunmoo-2A and 2B design are also similar to that of Israel’s LORA and the United States’ ATACMS.7 Its design similarities to the Iskander, as such, may instead be due to capability requirements rather than imitation. Missile Defense Project, "Hyunmoo-2A," Missile Threat, Center for Strategic and International Studies, October 10, 2017, last modified June 15, 2018, https://missilethreat.csis.org/missile/hyunmoo-2a/. “Nike-Hercules variant (NHK-1/2 or Hyon Mu 1 and 2,” in IHS Jane’s Weapons: Strategic 2015-2016, ed. James C. O’Halloran (United Kingdom: IHS, 2015), 68-69. Kim Minseok & Bradley Perrett, “Seoul’s Latest Ballistic Missile Close To Deployment,” Aviation Week, July 19, 2017, http://m.aviationweek.com/defense/seoul-s-latest-ballistic-missile-close-deployment. Andrew Logie, “The Answers: North Korea: How do you solve a problem like North Korea?,” (Marshall Cavendish International Asia: Singapore, September 2012), 188, https://books.google.com/books?id=6e2IAAAAQBAJ&pg=PA188&dq=Hyunmoo&hl=en&sa=X&ved=0ahUKEwi5npra0onVAhUJyj4KHbZWB1sQ6AEIMjAC%20-%20v=onepage&q=Hyunmoo&f=false#v=snippet&q=Hyunmoo&f=false. The Hyunmoo-2C: South Korea’s 800km Missile, Arms Control Wonk Podcast, June 30, 2017, http://armscontrolwonk.libsyn.com/the-hyunmoo-2c-south-koreas-800km-missile. “Design Characteristics of South Korea’s Ballistic and Cruise Missiles,” Nuclear Threat Initiative, November 2014, http://www.nti.org/media/pdfs/design_characteristics_of_south_korea_missiles.pdf?_=1415661529; Minseok & Perrett. Franz Stefan Gady, “South Korea Test Fires New Ballistic Missile,” The Diplomat, April 7, 2017, http://thediplomat.com/2017/04/south-korea-test-fires-new-ballistic-missile/. Lee Yong-soo, “S.Korea, U.S. Flex Muscles After N.Korean Missile Launch,” Chosun Ilbo, July 6, 2017, http://english.chosun.com/site/data/html_dir/2017/07/06/2017070600997.html. Missile Defense Project, “South Korea Conducts Live-Fire Drills and US Eases Missile Restrictions,” Missile Threat, September 7, 2017, https://missilethreat.csis.org/south-korea-conducts-live-fire-drills-us-eases-missile-restrictions/. Missile Defense Project, “North Korea Fires Another Missile Over Japan,” Missile Threat, September 15, 2017, https://missilethreat.csis.org/north-korea-fires-second-missile-japan/.